Elvis Presley was no.1 in the record charts with “A Fool such as I”. And I was coming up to my twelfth birthday. It was not until some years later that I eventually discovered what had been Scotland’s only professional SF magazine. By then I was working as a print apprentice in Hull, haunting bookshops during my lunch hours. And it was there I came across a trove of well-thumbed ‘Nebula’s in a second-hand shop on Prince’s Avenue. The bookshop is now an Indian Restaurant, but back then, over a period of months, I returned again and again buying issues at six old pence each, until I’d built up a respectably representative collection. ‘Nebula’ was one of the catalysts that seduced me away from ‘Dan Dare’ and ‘Jet-Ace Logan’, and onto adult SF. Some years before me a young Brian Aldiss was going through a similar process of discovery with regard to ‘Nebula’. 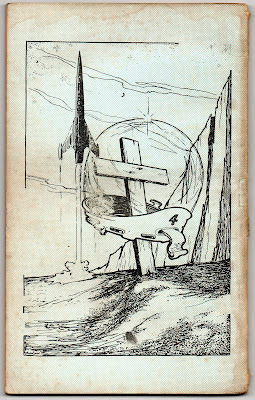 In his ‘Hell’s Cartographers’ (1975) contribution he recalls ‘at the time I began to write for publication there were really only two going SF magazines over here, ‘Authentic SF’ and ‘Nebula’… ‘Nebula’ was more exciting. I found an issue (no.3) in Freshwater, Isle of Wight, read it, and decided that I could do almost as well as the authors performing’. Working from such evidence I locate the issue he bought – dated Summer 1953 and priced at just 2/- (two pre-decimal shillings). The striking cover that attracted his attention is executed by Bob Clothier. A planetary surface swirls in magma coils. An aerodynamically tapering spaceship, hatch open, stands to the right. While a helijet buzzes its passengers towards a kind of towerblock-on-stilts complex across the page to the left. Below this picture is the ‘flash’ promising interior fiction by TEMPLE-BEAUMONT-TUBB, and within, it’s the work of these potential rivals that the young Aldiss would have read. The late Charles Beaumont – an American screenwriter responsible for scripting the outrageous ‘The Queen Of Outer Space’ (1958), provides a short story called “This Beautiful Woman”. The William F Temple novelette – “Limbo”, is about a fascist regime on Earth resisted by ‘a few incurable invalids in a Martian sanatorium’. 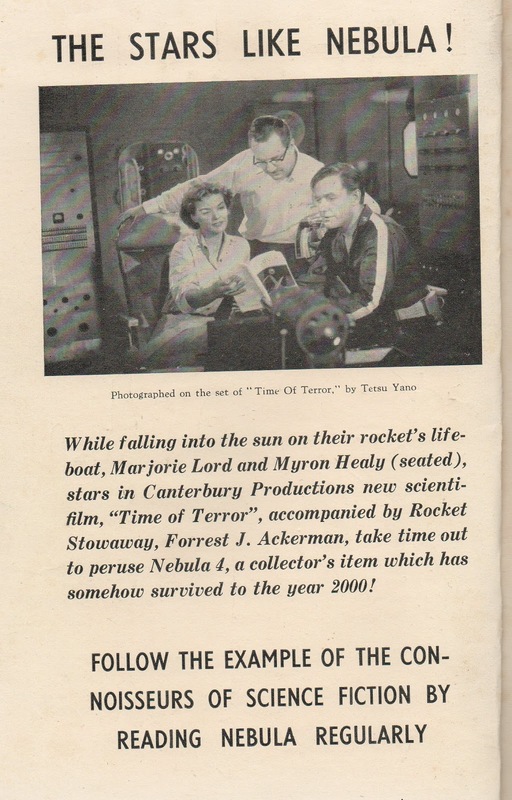 While EC Tubb’s novel “Freight” concerns a priceless Venusian rejuvenation serum. Aldiss would also have read fiction by HJ Campbell – editor of ‘Authentic SF’, and a ‘Scientifilm Preview’ of George Pal’s ‘War Of The Worlds’ (‘my eyes have seen the glory of the coming of the Martians!’) by Forrest J Ackerman. Aldiss would probably have ignored the full-page ‘Joan The Wad’ Lucky Mail-Order Piskey advert, but might have paused to fill in a line or two of the SF Crossword… sixteen across (three letters) reads ‘this, applied to fans, means new readers of science fiction’. In our separate time-frames both Aldiss and myself would probably qualify for the answer – ‘NEO’. 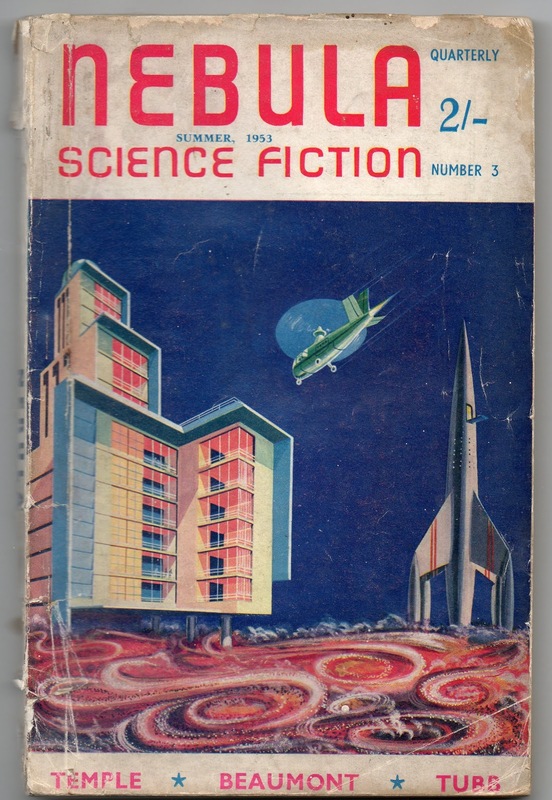 Peter Nicholls – in his ‘Encyclopedia Of Science Fiction’ (1979) entry, describes ‘Nebula’ as ‘part of the 1950’s British SF magazine revival, one of the most important titles along with ‘New Worlds’ and ‘Science Fantasy’’. Mike Ashley adds details in an essay for ‘Book & Magazine Collector no.8’, calling ‘Nebula’ ‘the only major rival to ‘New Worlds’’ and one that ‘holds the distinction of publishing the first stories by the leading American writer Robert Silverberg, and also those of British writer Bob Shaw’. And the statistics are revealing: Issue one includes the longest ever story – at 104 pages, and also the shortest, at just 1.5-pages. It sold 4,000 copies. The second issue doubled that readership, the third one hit 11,000. At peak it was selling 40,000 copies a month. Total sales of the first twenty-three ‘Nebula’s topped 375,000 and include almost a million words of fiction. 9l.9% of this fiction is British – with 12.9% of the stories written by authors who made their first-ever appearance in the magazine. Very few reprints were used, but many were subsequently reprinted in magazines ranging from the American ‘Saturday Evening Post’ to the Swedish monthly ‘Hapna’. Hamilton was a ‘young Scottish fan who loved SF to such an extent that he plunged all his slender resources into his own professional magazine… plagued by recurring ill-health that at times brought him perilously close to death, (he) had just been discharged from a nursing home when ‘Nebula’ was born’ (Kenneth Bulmer writing in ‘The History Of The Science Fiction Magazine: Part 3’, 1979). Indeed, the editorial of the first issue recounts how ‘since April, when I tore myself out of a nice restful nursing-home, I have alternated between wishing I was back in it again, and blessing my job and fandom in general’. Yet Hamilton’s was very much a hands-on editorial style, as Aldiss recounts; ‘he took a lot of trouble trying to make the stories I submitted publishable, but without much success – for one thing, I’ve always disliked rewriting at an editor’s behest’. Some mistake here? Hamilton published Aldiss regularly – thirteen tales in all, with or without tampering. “The Great Time Hiccup “ – the first, appears in no.12, and is set in an orbiting space station as all time breaks loose through the solar system. It was commended by reader Mike Wallace of Hull because although ‘I’m not usually very keen on stories dealing with time… I think I enjoyed this story because there was no real hero’. Perhaps the copy that Mike read was also the one that he traded in at the Prince’s Avenue Bookshop. The one that I later bought…? From its initial 120-page format with thick ‘pulp’ pages, by that fourth issue ‘Nebula’ had expanded to 128 and gone from quarterly to a bi-monthly frequency. 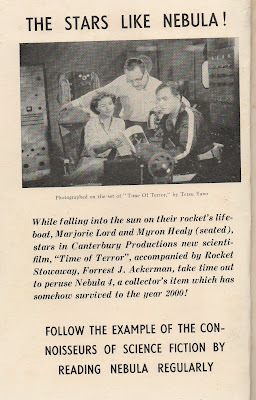 An advertisement in the ‘Vargo Statten Science Fiction Magazine’ boasts ‘‘Nebula’: Every two months it brings you 128 BIG pages crammed full of the most EXCITING and ENTHRALLING yarns you have ever read, written by all the WELL-KNOWN AUTHORS of Science Fiction’. It offers a year’s subscription for just 12/- (twelve shillings). By issue no.10, with the innovation of back-cover black-and-white line-drawings – often with a humorous edge, the evolution of style was complete. But the fiction was always the bottom-line selling point. And that’s where ‘Nebula’ excels. Pointing to the future developments of SF, Brian Aldiss was already playfully perpetrating story ideas of provocative imaginings. 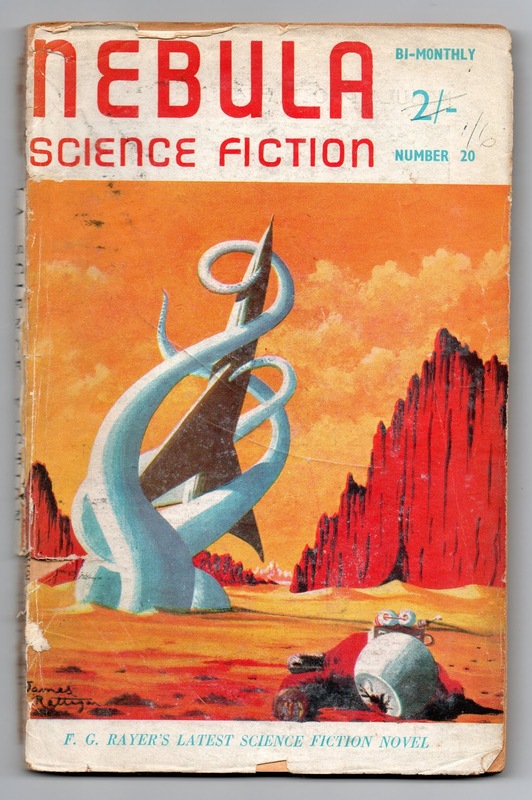 As was Robert Silverberg – on the event horizon of entering his prolific-hack period, and Bob Shaw, who was shifting gear from fanzine-fiction to finding his feet in the pro. Market. Then there is Ken Bulmer and John Brunner also destined for great things. Bulmer scores twelve appearances under his own name – including the only serial ‘Nebula’ ever ran, his four-part “Wisdom of the Gods”. Brunner manages six sales. Writers like Eric Frank Russell (ten stories), William F Temple (fourteen stories), and Charles Eric Maine (two) were already regarded as giants – the pioneers, not only of earlier British magazines such as ‘Tales Of Wonder’ (1937 to 1942) and ‘Fantasy’ (1938 to 1939, then 1946 to 1947) but of major penetrations into the American market too. 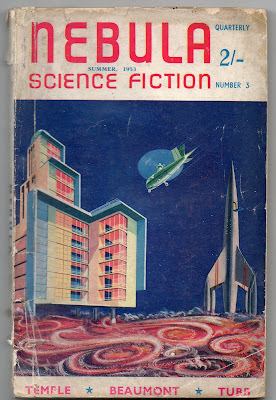 But the mainstay of ‘Nebula’ and its 1950’s and early sixties contemporaries was a unique and too-often subsequently neglected generation of hard-SF action writers. Unlike the New Wave that was to follow, they were largely intuitive, as distinct from academic writers. Story-tellers operating on the thrilling yarns principle rather than the carefully-wrought aesthetic powered by artful manifesto. ER James was a postman (nine stories). Philip E High, who created some of the most awesomely horrific weapons in the history of the genre, was a bus-driver (twelve stories). EC Tubb who dominates the scene like a literary colossus, was at various times a printing-machine salesman – and a traffic warden (twenty-seven stories). Then there is Sydney J Bounds (five), FG Rayer (four), Robert Presslie (seven), Lan Wright (six), and Peter J Ridley (four stories). Theirs is, in some ways, a Skiffle literature. A DIY Folk-literature, created from their love of the genre, and the raw stuff of their dreams ignited on battered typewriters that gave them access to the poorly-paid but addictive arena of print. And an audience. The stories are two-fisted adventures spanning a consensus of known worlds. Bite-sized easily digestible planets. A Solar System mutually built, explored and reinforced by their separate but collective flights of daring. Mars is Egypt shoved into space, a world of vast deserts concealing the menace and tortured romance of tombs and lost cities from forgotten civilisations. Venus – a magnified Brazilian rainforest, a garish fog-shrouded dripping-wet domain of trackless jungles populated by fantastic primitive beasts. Mercury is Iceland where volcanic superheat co-exists across a twilight zone with intense glacial cold. While beyond the mining worldlets of the asteroid belt there are moons beneath the spectacular skies of Jupiter and Saturn, bleakly chill, but not entirely inhospitable to the determined Spacer with thick parka and thermal underwear. Robert Silverberg recalls his first sale in HIS contribution to ‘Hells Cartographers’ – ‘I sent a short story called “Gorgon Planet” off to a magazine called ‘Nebula’… and in January 1954 (Peter Hamilton) notified me that he would use it, and sent me his cheque for $12.60. That same month I sold a novel to a major American publisher’. 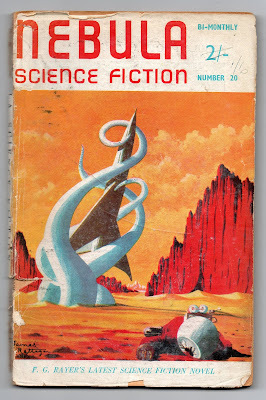 “Gorgon Planet” saw print in no.7 (an issue led off by William F Temple’s “Pilot’s Hands” novel, and Charles E Maine’s “Trouble-Shooter”). ‘Bob, a young native of Brooklyn, makes his very first appearance in this issue of ‘Nebula’’ boasts the editorial, welcoming him – and David S Gardner to the contents listings. ‘I predict they will go far if they can keep up this standard of writing’ before inviting the response ‘what is your opinion?’ In the follow-up poll Gardner’s story actually rates higher in reader’s opinion, with Silverberg collecting a mere 7.9% of the vote. Nevertheless, it led to seven further appearances. David Kyle in ‘A Pictorial History Of Science Fiction’ (1976) suggests that through his ‘intense personal style’ Peter Hamilton made ‘Nebula’ ‘a labour of love, a respected, if sometimes a little amateurish publication’. Amateurish? In view of such evidence I’d disagree and redirect Kyle’s attention instead to the ‘Vargo Statten Science Fiction Magazine’ or even John Spencer’s ‘Tales Of Tomorrow’ which give new meaning to the word. There WAS a strong ‘fan’ input provided by Walt Willis, legendary editor of fanzines ‘Hyphen’ and ‘Slant’. His news column was a regular and popular feature. But SF historian Mike Ashley achieves a more correct balance, ‘I tend to delight in small-press magazines because of the passion and commitment that go into them, and Peter Hamilton brought that quality to ‘Nebula’. It had a feeling of family about it, and thus came across as very personal, which (‘New Worlds’ editor John) Carnell was never able to do”. ‘Nebula’ says Ken Bulmer, ‘despite its name, was never nebulous’. It began in 1952. Al Martino was no.1 in the recently inaugurated Pop charts with “Here in my Heart”, and Dan Dare was ‘Marooned on Mercury’. It ended, due to Peter Hamilton’s ill-health, seven years and fourty-one issues later, in 1959 – by which time Dan Dare was adventuring on the planet Terra Nova. ‘Nebula’ might be many years dead, but it still reads like it’s alive. I'm trying to get in touch with Peter Hamilton, the editor of Nebula. I'm organising an exhibit of 100 years of Scottish magazines and we'd love to include Nebula. Do you know how I could contact him? Peter is a disc jockey on Radio Bute.